The Blessed Virgin appeared in Monte Berico, to an elderly of 70 years, Vincenza Pasini, wife of John of Montemezzo, while bringing lunch to her husband who was working in the fields. She said, "I ask you to build a church here in my honor. If they do, the plague will stop, otherwise continue with more violence. "But neither the bishop nor the priests believed her and the plague continued ... 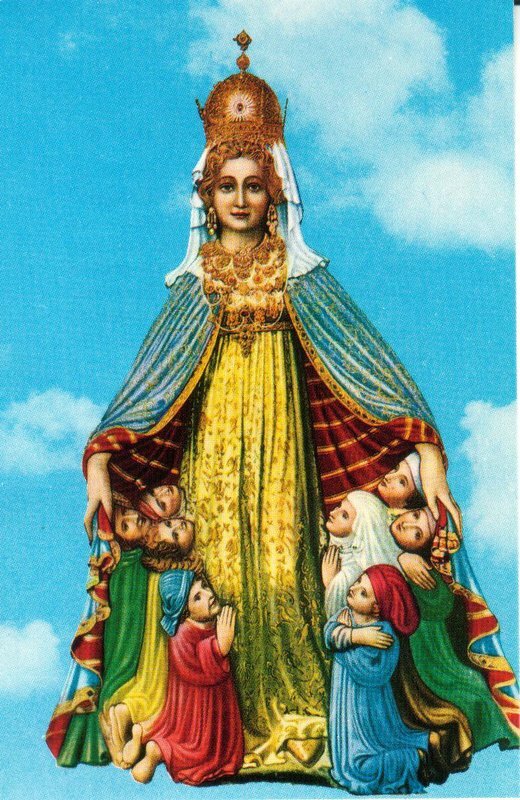 Appeared to her still other times, insisting on repeating the same words, until August 25, 1428, and then the whole population believed , led by the bishop, who climbed Mount Berico to start the construction of the Church. Found a spring and in that place occurred many miracles and healings. The plague ceased, and the Bishop recognized the apparitions as authentic. After a century, the source was exhausted, but in 1955, during excavations for the new convent, found the spring of water. The Virgin appeared again to Vincenza Parisi, on August 1, 1428. The city was in dire straits, and the Virgin repeated her request and her promises to the old woman. Vicenza went back down to the city and she was believed this time: the city officials, the Council of One Hundred and the Council of Five Hundred gathered in the Great Hall of Reason, and decided to build the church on Monte Berico in as short a time as possible. So the people started building twenty-four days later. The Virgin had told Vincenza about a water source that would flow out of a rock in the place where the shrine would be built, and this is exactly what happened. During the construction work, "a marvellous and incredible source of water flowed... to the point of flooding the area like an abundant river coming noisily down the mount." Also, in reference to the Virgin's second promise, great quantities of money were received. "Construction was begun on August 25, the great plague partly disappeared, and the church was completed in three months. After that the region was completely freed from this great calamity, so much so that ever since that day, through God's protection, it has never again suffered from that disease. " The busy shrine of Our Lady of Berico has now become one of largest shrines dedicated to Mary in Europe. "On the first Sunday of the month we have an average of twenty-two thousand confessions. Sometimes we stay until ten o'clock p.m. in the confessional," stated a member of the Servites of Mary, the congregation which has watched over this beautiful site and its magnificent panorama since 1435. In 1821 were casted the 15 bells in B, rung in the Veronese bellringing art.